One wonders whether it was the pressure of the occasion taking a toll on Pakistan Women in its last ICC Women’s World Cup Qualifier 2017 Super Six game at P Sara Oval on Sunday (February 9) against India Women, but things went pear shaped for it pretty quickly. Pakistan was dismissed for 67 in 43.4 overs after being asked to bat by India in overcast conditions. 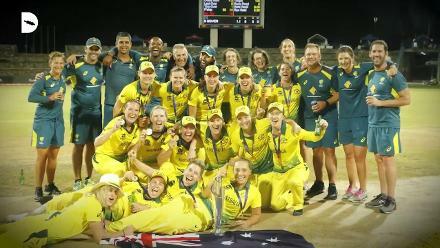 India then reached 70 for 3 in 22.3 overs on either side of the lunch break to win by seven wickets and go into the final, to be played against South Africa Women at the same venue on February 21, on a high. The win made India the only undefeated team in the tournament so far, while the silver lining for Pakistan despite being bowled out for less than 100 for the first time since March 2014 was that it still managed to qualify for the ICC Women’s World Cup in England in June. 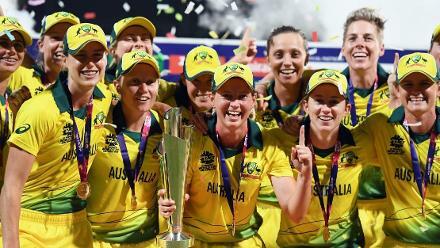 On the day, Ekta Bisht’s career-best figures of 10-7-8-5 and Veda Krishnamurthy’s two excellent catches at first slip underlined the gap between the two sides in this format. Shikha Pandey was the first to strike in the seventh over when Nahida Khan cut her straight to Bisht at point. 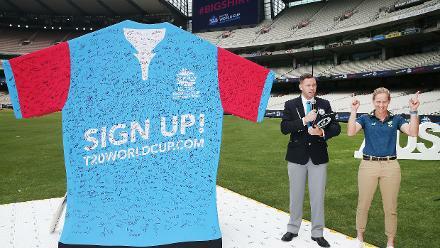 She struck in her next over again when Javeria Khan, the tournament’s highest run-getter, edged an incoming ball that swung away just enough. 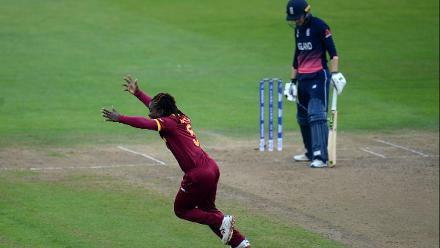 Veda anticipated well to take a couple of steps forward and complete a two-handed catch in front of her. India could have had its third wicket in the Power Play had either Devika Vaidya or Mansi Joshi held on to chances offered by Ayesha Zafar in the space of three balls. 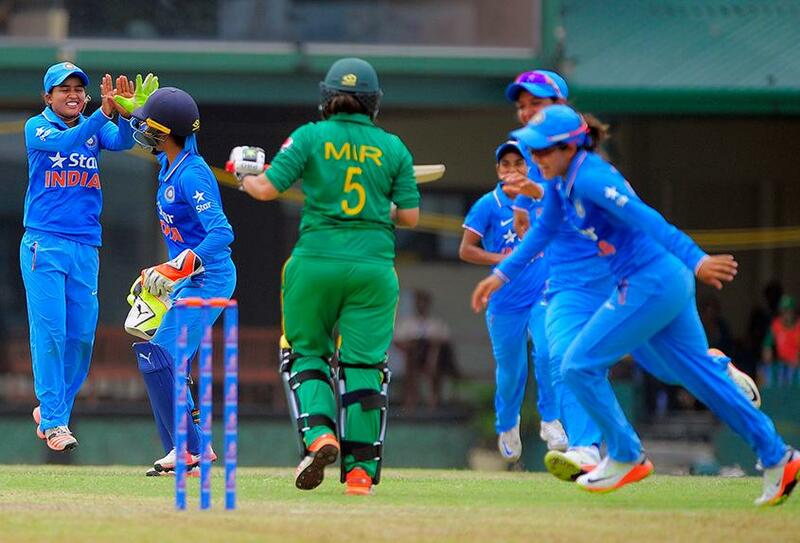 But Zafar wasted her luck to be lbw off Bisht’s first ball of the match in the 11th over. Rested against Bangladesh Women, Bisht started with an arm ball that Zafar played down the wrong line to, to be the left-arm spinner’s 50th ODI wicket. Bisht, only the ninth Indian to achieve the feat, then went past the tally of Purnima Rau, India’s coach, when Nain Abidi stepped down the track to play against the turn. She was left stranded as Sushma Verma completed an easy stumping. 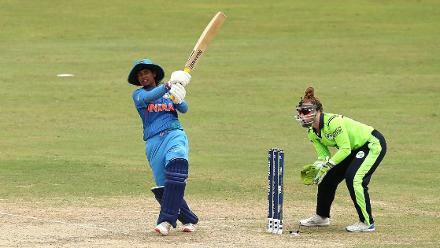 Deepti Sharma’s drift then deceived Bismah Maroof, who got a faint under-edge while playing a sweep, and Vaidya came from around the wicket to have Aliya Riaz bowled. Then came the catch of the match. A non-committal Sana Mir cut Bisht only for Veda to take a stunning one-handed catch to her left at slip on the second attempt. Veda bolted off to square-leg in celebration even as her teammates chased her to mark the moment. Rabiya Shah became Bisht’s fourth wicket when Mona Meshram took an easy catch at second slip. 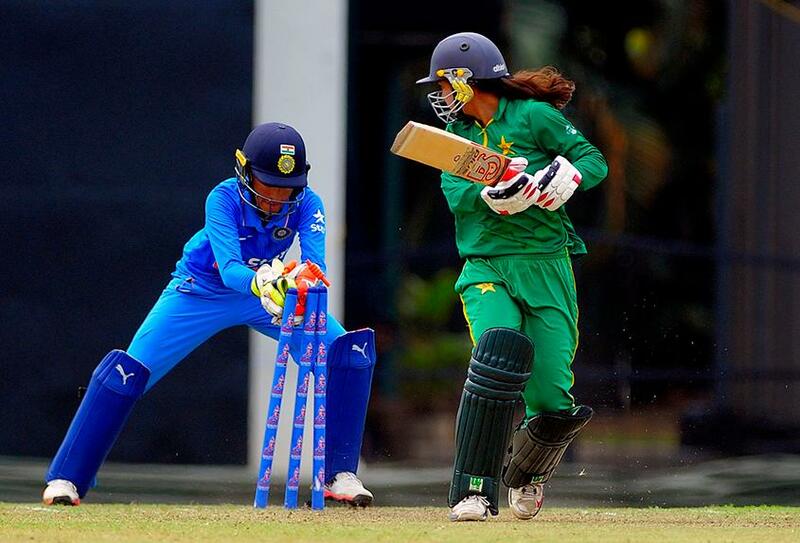 Sadia Yousuf and Nashra Sandhu took Pakistan past 57 – its lowest total against India that had come in the 2009 ICC Women’s World Cup in Australia – before Bisht changed ends to have Yousuf bowled and become only the seventh Indian to take a five-for in ODIs. 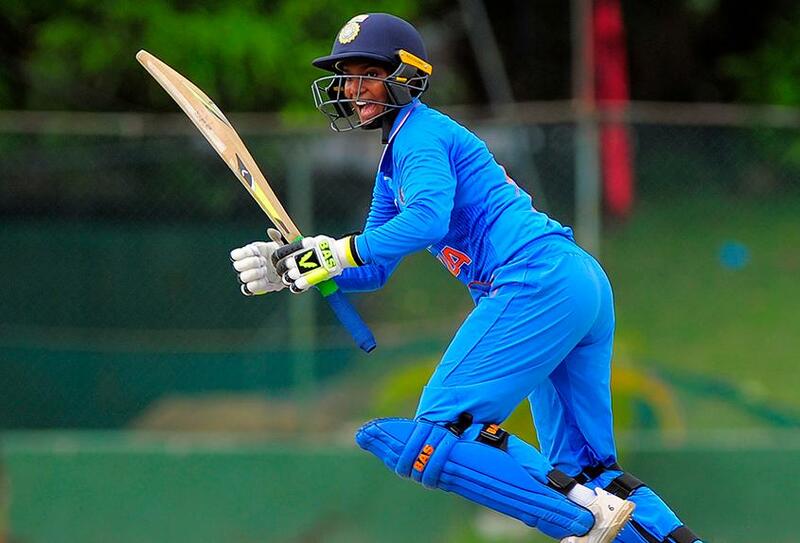 Harmanpreet Kaur, leading in place of Mithali Raj who had stepped out, then brought herself on and needed just four balls to end Pakistan’s resistance. 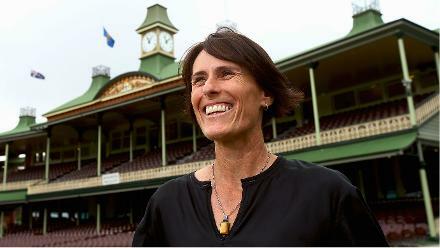 She became the fifth Indian spinner in this tournament to take a wicket. Of the 60 wickets India have taken in seven matches so far, Bisht, who with 12 scalps is now the tournament’s second-highest wicket-taker, Poonam Yadav, Deepti, Vaidya, Rajeshwari Gayakwad, who was rested for this game, and Harmanpreet have taken 42. Except for a couple of short balls by the pacers that had been dispatched to the boundary early in the piece, India dominated proceedings completely, bowling a total of 18 maiden overs. 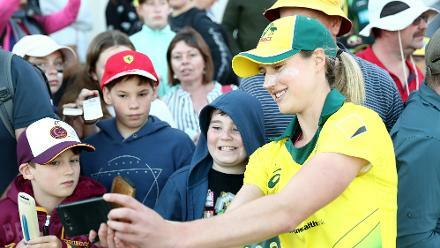 Bisht relied on her strength to tie the batters down, and was particularly ruthless in her last five overs where she conceded no runs and picked up three wickets. Meshram square cut Mir to the fence off the first ball of India’s innings to get the chase going. Meshram and Vaidya fell in the space of 13 runs as India went to lunch at 23 for 2 in 7.5 overs, but after the break, Kaur produced the shot of the match when she pulled Sandhu, the left-arm spinner, for a six over midwicket and followed that up with a straight four with a back-foot punch. She was caught at cover for 24 before Deepti, who remained unbeaten on 29, and Veda completed India's 12th ODI win on the trot.